Help: Looking for (a Good) Home .. Dogs appear to be the theme of the week. For as far back as I can remember, I have always brought home stray animals. Cats, rabbits, dogs, rats .. whatever I knew had been abandoned or injured made its way home with me as a child. My affection for animals, any/all/lost/hurt/stray/whatever comes my way, continues as an adult ..
Much to the amusement and dismay of those closest to me. As I was driving to an appointment yesterday in a very remote area, I saw cars swerving ahead of me. Deer, I figured. I slowed as I approached the area. Sure enough, I thought as I saw something small and tan alongside the road. But as I got closer I saw it was actually a dog. Then a second appeared. They didn’t seem to care they were wandering out into whatever traffic happened to be coming along. They were just wandering. Checking things out. Not seeming to have a care in the world, even if it did have 18 wheels on it and was headed for them. I looked around quickly, no ranches, no homes, we were miles from any town. Nothing seemed to be within wandering off distance for the two. And still they wandered down the middle of the two lane highway. Now, I’m pretty sure what I did next is something most rural folks don’t do very often. I pulled over. Backed up. And got out to see if they were ok. 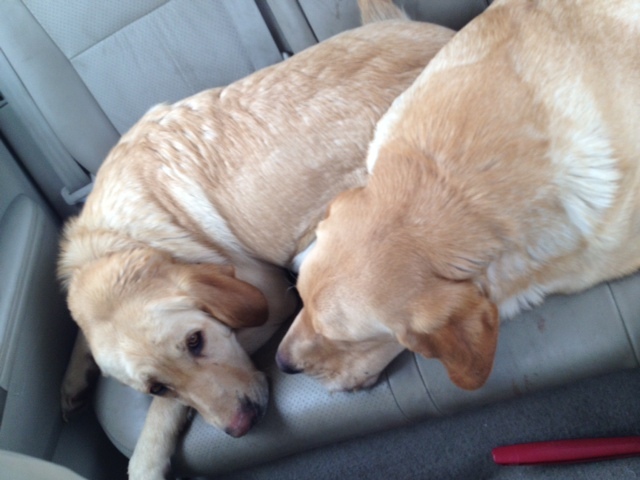 Tails wagging, tongues flapping about and seeming overall healthy, into the back seat they went. I drove about 4 miles to the nearest town. It was early and in that town of about 800 I saw no one around. The two businesses I could find weren’t yet open. I had to get to my appointment. They went with and crashed in the backseat as though they hadn’t slept in days. I called everyone I could think to call, the Sheriff’s Office and filed a report, area Shelters, businesses, residents. No one seemed to know of or be looking for this pair. Hours later, I came back through that small town, made a couple more stops into the only places the locals could think they might belong. Other shelters in surrounding counties weren’t answering calls or were at capacity with no room to take them. Our local Veterinary Clinic said they would add to the list of dogs they already had that had been abandoned in case anyone called. “Be prepared for a couple overnight visitors,” I told the Cowboy as I got closer to home. Not exactly what he wanted to hear, especially after the conversation from the day about our own dogs. But they were sweet and stuck close and seemed to appreciate the help. I hope someone out there is missing them and searching. I’m trying to make it as easy as possible for them to be found. But I cried today as I dropped them off at the only shelter that would take them. 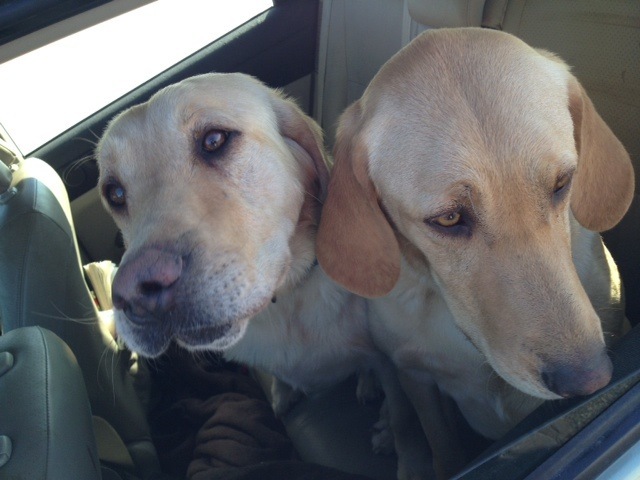 Had they been able to get along with our two labs, we would have continued to foster until home or a new home was found. Or. I might have kept them. Had everyone been cool with it. “Four dogs, on top of everything else we have is just too much,” says the Cowboy. I’m not sure we’ll ever see eye to eye on that one. Regardless, I am quite certain there will be others someday finding shelter in the backseat of my car. If only temporary. Wishing our girls good luck. Hope hope home finds its way back to you again, soon. 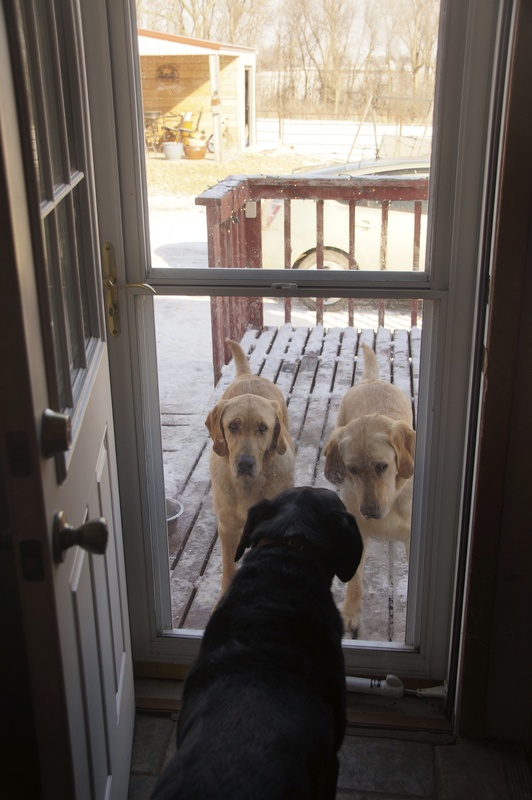 This entry was posted in Adoption, Labs, Life, Lifestyle, Lost Dogs, Love, On the run, Ranch Living, Rural people, Rural South Dakota, South Dakota, Uncategorized and tagged Animal Shelter, Humane Society, Meandering, On the Run, Rural South Dakota, Strays, Yellow Labs by Carleen Wild. Bookmark the permalink. Oh my gosh, they are so adorable. I wish, wish, wish I didn’t think 5 dogs would be too much! Same here .. I’m going to call to check in on them tomorrow and see if home came a callin’ ..